Lost States: Nuclear fallout—in Chicago. And the atom bomb gun. Nuclear fallout—in Chicago. And the atom bomb gun. What's happening in Japan is a reminder of the challenge of keeping the nuclear genie in the bottle. And America's early nuclear history is surprisingly ugly. That is, we exploded a lot of atomic bombs on ourselves... and likely killed a lot of people. Yes, the government called them perfectly safe "tests," but once you realize what actually went on, you might think otherwise. In the early 1950s, the U.S. government "practiced" with nuclear bombs in Nevada; dropping them out of planes, exploding them from tall towers, even shooting them out of a gun. Yeah, not kidding about that. For people living in the region, it became a part of the regular routine. They never imagined the government would do anything that might harm them. Then the sheep started acting strange. 20,000 were exposed to excessive radiation in early 1953. They got blisters, wool dropped off, and the ewes began miscarrying—or worse: giving birth to gruesome, deformed lambs. Nuclear bomb shot from a gun. Really, we did this. Then the people started getting sick. The most famous group was the cast from the movie The Conqueror which was filming in the downwind path from the Dirty Harry detonation. Stars John Wayne, Susan Hayward, Agnes Moorehead all died of cancer. (Although Moorehead lived long enough to star as Endora on Bewitched). Of the 220 people on the cast and crew, 91 developed cancer—which is triple the number you'd expect in the general population. Harry was, by far, the worst of the atomic tests, kicking up enormous amounts of radiation into the atmosphere. The government scientists dutifully launched weather balloons (as was the usual procedure) to track the fallout. 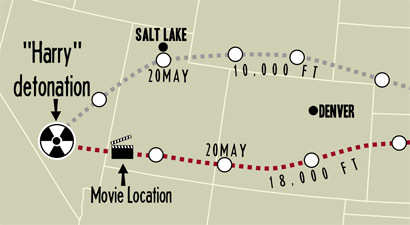 The map below (adapted from the official report) shows the balloons' path across America. When you have a cloud of radiation dust floating around, the worst thing that can happen is rain—yet that's exactly what happened in Chicago on May 21-22, 1953, just as the toxic cloud passed by. The official report states that the Midwest got, "the highest values (of radiation) reported in that region for the series (of tests)." In fairness, we all get hit with a certain level of radiation every day. And no one (that I know of) is saying the fallout in Chicago had a significant impact on cancer rates in the Windy City. Fukushima notwithstanding, nuclear materials are handled pretty safely these days. But, in the early days, we didn't know what the heck we were doing! Read the full official report here.